2:36 on the MTRainbow chart we have a 2 day double top; it could induce some selling. 2:12 This "trade 2, take one quick" is an old technique used by many traders. Makes less money than "all or nothing"
2:04 posted my Fractal Grid in CCT Room. That tool comes from the Chaos Trading Made Easy course. I don't expect it, but want to be long if they do. 1:13 one of the challenges of trading is learning to be patient. Markets do nothing at least half of the time. So one has to learn to wait patiently. Daytrading is driven by the rotating earth. So you have to wait for the big ball to turn. Think about it like waiting for the sun to set. 11:33 when my wife worked on a pediatric clinic triage line, she complained that some days were "gritchy and bitchy." or Chaos Theory "strange attractors/strange repellors"
10:14 updated my chart in the CCT Room. Today I'm using the second chart so others can upload charts if they wish to the first chart. we have Moon T90 timeline early and T0 timeline late, so this is a "two moon" day. These are often volatile and one way, or Moon-Noon-Moon. I expect a rather dull day. First trade is 10:57 so have time to watch. 7/24/2009 11:44:52 AM MT cgm:: My projrcted HOD + Uranus $ . Good target & reversal? 7/24/2009 9:28:50 AM MT TG****:: Ok, posted ? in CCT room, thanks. 7/24/2009 9:21:04 AM MT Al****:: DP: should see good chart now. TG: ask me in the CCT Room, so i can answer privately. 7/24/2009 8:53:58 AM MT DP****:: GM Everyone. 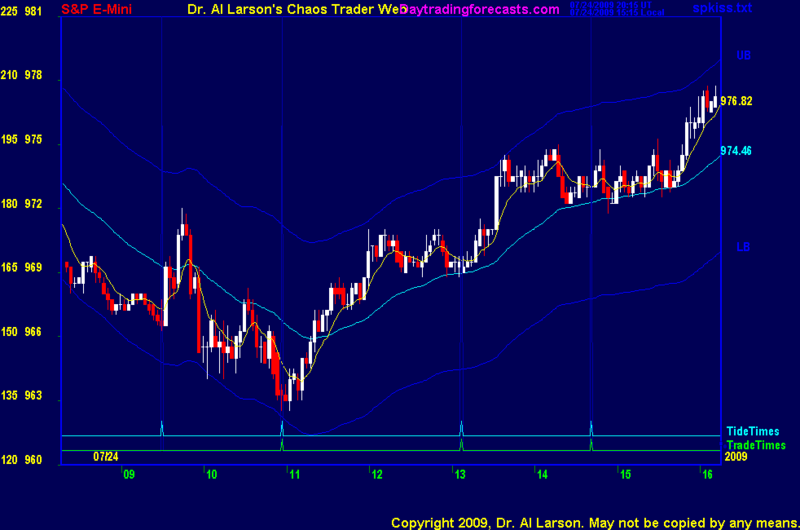 I notice that the second CCT chart shows only the down fractal overlay. Anyone else see the combined chart w/ fractal? Thanks. 7/24/2009 8:32:22 AM MT TG****:: Al, if you get a chance, A CTME question pertaining to today. What would you use as today's PQ?